2012 Ford Focus Pros and Cons: Why (Not) This Car? Feeling that North American compact car buyers want to spend as little as possible, Ford has rarely offered the same car on both sides of the Atlantic. New outsider CEO Alan Mulally changed this, stipulating that from now on Ford will offer the same cars worldwide. How good is the "good stuff" Europe has been getting? With the 2012 Ford Focus, we find out. Like the exterior, a little overstyled, but feels sporty and solid. Why the 2012 Ford Focus? My overall impression of the 2012 Focus is very positive. But what, exactly, is so impressive about this car? It's not easy to say. This is one of those cars where the whole is greater than the sum of the parts. But if I have to pick something, it's ride quality. Not that the Focus rides like a traditional American luxury car--it doesn't. Instead, the compact Ford has the solid, stable, thoroughly composed ride you usually have to buy a much more expensive car to enjoy. Torn up roads don't faze it. The Focus's steering and handling aren't as razor sharp and communicative as I'd like. To some extent, this is a necessary cost of the refined ride quality, though the fuel-economy-maximizing electric power steering (EPS) likely also plays a role. The car nevertheless handles very well, and feels better the harder you push it. Especially with a five-speed manual the Focus is fun to drive, and goes precisely where you point it. Overdone tail lights, but otherwise an attractive shape. The SE lacks the padded upper door panels that grace the Focus SEL and Titanium. Its interior still vies with that of the Chevrolet Cruze for "best in class" honors. Nearly everything looks and feels deserving of the car's premium price point. In the SE, I especially like the highly textured black cloth seats. Beyond the surface materials, the Focus has a very solid feel that in the past could only be found in cars from Germany. No big surprise, perhaps, since the car was largely designed by Ford's European branch. The Focus looks best with the 18-inch five-spoke alloys optional on the Titanium. The 17-inch black slloys included with the SE's Sport Package are more of an acquired taste. Why stress the wheels? The Focus's fluid but somewhat busy exterior styling doesn't work so well with wheels other than these two. 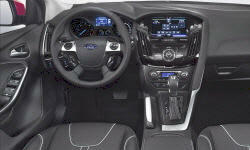 With a dual-clutch automated manual transmission, the Focus earns EPA ratings of 27 city, 37 highway. The five-speed manual knocks this down to 26 / 36. The trip computer reported low 30s in suburban driving with the AC on high. Why Not the 2012 Ford Focus? The rear seat is fairly comfortable--if you fit. Many compacts have roomier back seats. Many people have had trouble operating the MyFord Touch system in upper-level Focuses. Ford has been offering updates to address these concerns, but it could be a while before the system is where it should be. The tested SE doesn't have this system, but the rocker switches used for many audio system functions are also much unlike those historically offered in American cars. I never did figure out how to do some things with them. 160 hp is merely sufficient, but the 2.0-liter four revs willingly and smoothly enough. Ford might now offer a premium compact car in North America, but it comes at a premium price. Once among the least expensive small cars, the Focus is now among the most expensive. A decidedly mid-level 2012 Focus SE hatchback with the Sport and Convenience Packages lists for $20,930. A similarly equipped Mazda3 SKYACTIV lists for $1,185 less before adjusting for feature differences, $395 less afterwards. If you want a compact hatchback with a manual transmission, there aren't many other options. Comparing automatic sedans, a Hyundai Elantra GLS is $2,290 less before adjusting for feature differences and $1,150 less afterwards. 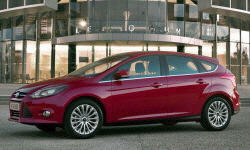 The 2012 Ford Focus is not cheap, but its appearance and feel justify a relatively high price. The Focus is also fun to drive and bets good gas mileage. Overall, it's my favorite mainstream compact car. Need more power? For 2013 a high-performance ST variant will be offered. One-week loan. Ford provided an insured car with a tank of gas. 2012 Ford Focus pros and cons, according to Michael Karesh: the best reasons for buying (or not buying) the 2012 Ford Focus. Join TrueDelta to post your own impressions.